Use this tool to design and print personal or employee time sheets that will correspond to whichever of the time calculators you are using to calculate hours and gross wages. Customize heading, text, background, and border colors (over 140 to choose from), as well as the number of In-Out columns. Also includes auto-fill feature to add day names and/or dates to each day of the payroll period -- all formatted to your preferences. Plus, a preview of the time sheet updates as you make changes. Select your pay period type. Note that if you select the semi-monthly pay period type you will be required to select either the 1st or 16th of the month as the starting day. Select the month and day and enter the 4-digit year of the first day of the pay period. If you don't want the start date to appear on the time sheet, uncheck the checkbox. Select the number of In/Out columns you would like included in the timesheet. Select how you would like the day of the week displayed in the timesheet. If you don't want the day of the week to display on the time sheet, choose None. Select how you would like the date displayed in the timesheet. If you don't want the dates of each pay period day to display on the time sheet, choose None. Tap the buttons in this row to open a form to change the styling of the headings (H1), sub-headings (H2), regular text, and borders. The time sheet preview will be updated as you make changes. Tapping the Reset button at the bottom of the calculator will restore the default design settings. Select or enter your preferred background and font colors for the main headings. The corresponding hexadecimal equivalent will be displayed in the adjacent field. If you choose OTHER and tap in the adjacent hexadecimal field, a scrollable 124-color pallet will open. Select or enter your preferred background and font colors for the sub headings. The corresponding hexadecimal equivalent will be displayed in the adjacent field. If you choose OTHER and tap in the adjacent hexadecimal field, a scrollable 124-color pallet will open. Select or enter your preferred background and font colors for regular text. The corresponding hexadecimal equivalent will be displayed in the adjacent field. If you choose OTHER and tap in the adjacent hexadecimal field, a scrollable 124-color pallet will open. Set the preferred color, type, and width of the timesheet borders. When a color is selected the corresponding hexadecimal equivalent will be displayed in the adjacent field. If you choose OTHER and tap in the adjacent hexadecimal field, a scrollable 124-color pallet will open. Enter the name of the employee you want to be displayed on the timesheet. 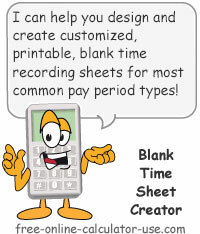 If you are printing multiple blank time sheets you can leave this field blank and fill in the employee names by hand. Are you wasting valuable time creating and dating time sheets for your employees by hand? If so, then you'll love the timesheet creator on this page. This tool was created as an extension to the popular weekly and biweekly time-sheet/time-card calculators in this section. Now, in addition to quickly totaling up employee hours and wages, you can also design and print out the time sheets that coincide with the time calculator you use. Can accommodate weekly, biweekly, semi-monthly, or monthly pay periods. Option to include day names and dates for each day in the pay period -- each with formatting options. Choose between 1, 2, or 3 IN/OUT columns. 140 colors to choose from for Headings, Sub-Headings, and Text -- backgrounds and fonts. Choose from 140 border colors, plus 4 different border types and thicknesses. Option to enter employee name. Changes to the design occur instantly on the preview. Select your pay period type. Set the start date of the pay period. Uncheck the box if you don't want the date to appear on the time sheet. Select the number of In/Out columns. Select the Day format to use on the time sheet. Select the Date format to use on the time sheet. Tap any of the design buttons to change to their respective background, colors, etc. Enter the employee's name if you would like it included on the time sheet. Tap the "Preview Blank Time Sheet" button to see a preview with the current settings. Note that the preview will change automatically as you make changes in the top section of the calculator. Tap the "Printer Friendly Sheet" button to open the time sheet in a new window for printing.